An aftermarket shroud / fan assembly can allow a fan to maximize its effort, sealing off the remainder of the core in a cramped engine compartment. A downflow radiator features a horizontal top tank and bottom tank. When hot coolant leaves the engine, it enters the top tank and then travels down to the bottom tank via tube passages in the core, pushed by the water pump and aided by gravity. Along the way, as coolant runs through the core, the fins provide additional surface area for heat transfer to the atmosphere. 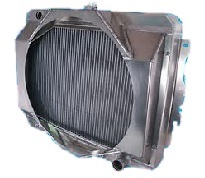 A crossflow radiator features a vertical tank on each side. The coolant moves as it’s pushed along by the pump from the high-pressure (entry) tank as it receives coolant from the engine, through the core to the low-pressure (exit) tank on its way back to the engine. Basically, either style works. A builder will usually decide between a crossflow or downflow radiator based on the engine bay’s packaging limitations. 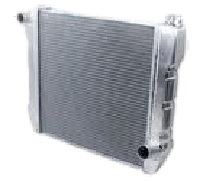 In theory, a crossflow radiator is said to be more efficient since the radiator’s pressure cap is located on the low-pressure side of the radiator, which allows longer high engine speed operation without forcing coolant past the pressure cap. The (usually) larger surface area of a crossflow radiator may also allow the use of increased radiator capacity and cooling surface area. However, if the vehicle owner desires an original, nostalgic appearance, a downflow may be the only choice. Also, retrofitting a crossflow radiator into an engine bay that was originally designed for a downflow unit may require a certain amount of fabrication time, which may or may not be an issue. In order to gain increased core surface area, creativity comes into play. On the flip side, in many cases a downflow style may actually transfer heat better than a crossflow. is to use what fits best, always making sure that you take full advantage of the available space in terms of radiator core surface area. You also need to take into consideration things such as ensuring proper airflow, use of a properly shrouded fan, an efficient water pump, obstruction-free block coolant passages and the use of an applicable thermostat. "Single, Dual or Triple Pass?"